I know I am a freak. A freak for everything wobbly and sturdy. I love mango pudding with a passion. I love it so much I could not describe to you how much but to need to have you to see it for yourself say here, here, here and maybe here too. I made this along with the Christmas Stained Glass Jello and the Best Chocolate Sheet Cake. Ever for the Christmas Eve party too! I know, a lot of jello and pudding but they are yummy and melts in the mouth. I love them! This is adapted from WorldFoodieGuide (made with Method B, the so-called relatively more complicated method). It tasted great and texture wise, wobbly enough for my liking but properly set. It uses raw egg and instant mango jelly powder in place of gelatine and is very similar to my previous cheat's mango pudding. With a recipe provided from someone from Hong Kong, I had a hard time resisting trying it. Not sure about elsewhere, but here in Australia, when we say Yum Cha (directly translated from Cantonese to English as 'Drink Tea'), we really meant going to a Dim Sum place (usually owned by someone from Hong Kong) and have dim sum and mango pudding is always a must order item. It was great but the only downside is it is too sweet for my liking. I am guessing it is the sugar content in the instant mango jelly powder that varied it. I have to macerate mango cubes with lime juice and top it off to balance the sweetness. It is finished but would have been amazing if it is less sweet. Dissolve the pack of jelly powder with the 1 cup of boiling water. Add in the crushed ice and stir to dissolve and set aside to cool completely. Add the sweetened condensed milk and the fresh milk to the cooled jelly mixture and combine well. Then add the beaten egg and *mango cubes. Stir everything to combine thoroughly and pour it into little cups. Chill it overnight for best result or for at least a couple of hours. Serve chilled. * You can puree half the mango cubes and add it into the jelly along with the milks or just add them into the jelly mixture as it is. I used the mango cubes to top the jelly instead. Made this for a friend's birthday cake. 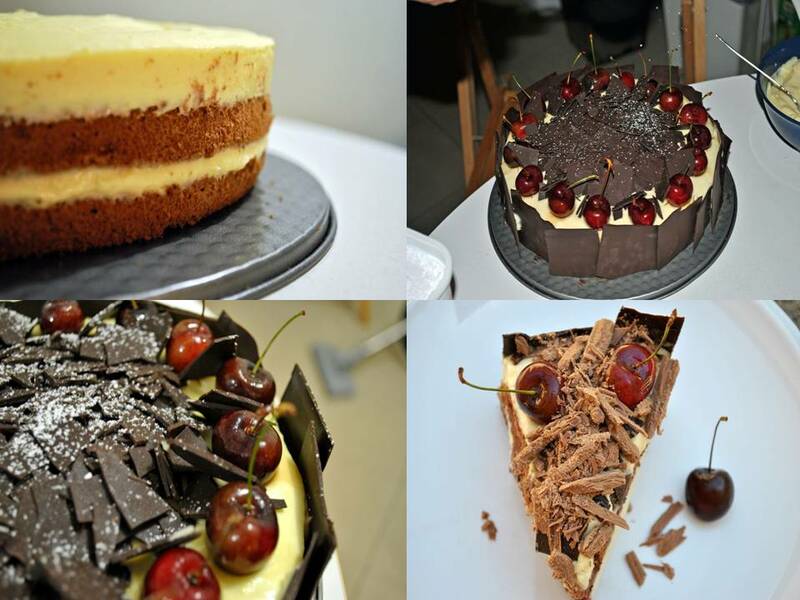 When I first started making it, I've been made known she loves blackforest cake and durian. I wanted to make this easy black forest cake using readymade savoiardi/ladyfinger biscuits that you would use for Tiramisu. Then I recalled I've made a Durian Tiramisu a while ago. I did not feel like using storebought Savoiardi and did not want to make any myself too. I ended up making a chocolate sponge cake and layer them with Durian-Mascarpone cream. I have also reduced champagne and coat the cherries in it for the decoration on top. The cake really is a combination of Durian Tiramisu and Black Forest Cake. Alcohol and durian do not mix, I am not sure if that is a myth or fact up till now but there really isn't enough champagne to make anything dangerous....The cake is at its best when left overnight as the durian flavour became more pronounced but you might want to top it off with the glazed cherries upon serving because the cherries tasted like durian and champagne after being left overnight in the fridge...I am bias and love my durian fruit. I cannot tell you how awesome this cake was! Preheat the oven to 175°c and line the base of an 8'' round tin with baking paper, trimmed to fit. Do not grease the pan. In a microwave safe bowl, measure out the canola oil and pour over the cocoa powder. Set it aside to let the cocoa powder dissolve a bit. In a large mixing bowl, whisk the yolks, salt, cherry liquor and castor sugar until pale and increased in volume. Microwave the oil-cocoa mixture until warm to touch and whisk it well to completely dissolve any cocoa lumps. Whisk the warmed cocoa oil into the yolk mixture and whisk to combine really well. Stir in the warm water and whisk to combine lightly. Sift over the plain flour, baking soda and baking powder into the mixture and whisk everything into one homogeneous mixture. Wipe a clean large bowl with lemon juice-dampened paper towel and pour in the egg whites. Whisk the egg whites with electric mixer (preferably hand held) until foamy and add in the lemon juice and continue whisking until it is completely white and increased in volume. Add in the sugar, a tablespoon at a time and stop whisking the very moment your bowl can be turned upside down with the egg whites defying gravity. Take 1/3 of the egg white batter and whisk it into the yolk mixture to lighten it up. Slowly incorporate the remaining egg whites in two batches and completely incorporated. Pour the batter into the prepared tin and bake it for 45 minutes or until cooked. Test with a skewer at 30minutes and if it comes out clean, the cake is done. When it is out of the oven, immediately turn it upside down and cool it completely before slicing it into 2 or 3 layers. Blend the durian with some of the cream to a fine puree. Sprinkle the gelatine powder over the 2 tbsp cold water and let it stand for 5minutes. Warm the durian puree in a nonstick pan over medium low heat. Turn off the heat and add in the gelatine paste. Whisk well to combine and completely dissolve the gelatine into the mixture. Add in the mascarpone cheese and whisk well to blend. Cool the mixture completely. Whip the remaining cream till stiff peak and fold it through the durian-mascarpone mixture. Chill it until needed. You will have some leftovers enough to fill a swiss roll nicely. Else, multiply the recipe with 0.75. Place the Champagne and sugar in a small pot and bring it to a boil, dissolving the sugar. Continue reducing it over medium-high heat for 8 to 10 minutes. Turn off the heat and add the cherries in and coat it well. Let it cool completely and it will glaze itself nicely. 2o0 grams dark cooking chocolate, melted over bain-marie. Simply pour melted chocolate onto a large piece of Glad Bake and spread it out evenly and thinly with an offset spatula. Let the chocolate dry until when you touch it with your finger, it would leave fingerprint on them but does not stick on your finger. Run a pizza roller and slice the chocolate into irregular rectangular pieces. In the same baking tin used to bake the chocolate cake, place a layer of the cake in the tin and pour over 1.5 cups of the durian mousse. Cover with a second layer of cake and pour over another 1.5 cups of durian mousse. Place the cake in the fridge to chill until the gelatine sets. To unmould, run a thin plastic knife around the circumference of the tin and unlatch the spingform tin. Transfer it to a serving plate or cake board. Working quickly with cool fingertips, dab a little of the durian cream on the chocolate pieces, one at a time, and slap it on circumference of the cake to form the chocolate walls. Break up the rest into shards and set aside. Chill it again from time to time if necessary. Arrange the glazed cherries around the edges and scatter the chocolate shards at the centre of the cake. Top with more Cadbury Flakes (I did this because I wanted a mixture of dark and milk chocolate. The dark chocolate was so bitter and my durian mousse has no sugar added to it at all). Chill until ready to serve. Slice with a hot, dry knife and wash and wipe dry with every cut to get neat slices else the chocolate walls will be teared down easily. Apart from the Christmas Stained Glass Jello, I've also made some cakes for the Christmas Eve party. I've made the best ever chocolate sheet cake, made famous by none other than The Pioneer Woman, Ree Drummond. It lived up to its name so well and indeed was the best chocolate cake. Ever! Because it was baked in a sheet pan (or what some would known as jelly roll pan), it did not take long to bake at all. The cake was ultra moist and we better not discuss the amount of butter that were sacrificed in the midst of making the cake. The cake itself, it's awesome! The frosting itself, it's awesome! When you pierce the cake all over like mad and pour the frosting over and let it seep through. It's even better! Then I realise I forgot the nuts, bummer! I sprinkle the toasted chopped nuts over and have a bite. And a long silence await. If Heaven really do exist, it is right here. Will you all please spell it together with me while taking a virtual bite. H-E-A-V-E-N! It has been a looooooog time and I'm afraid just too little, too late. Still, Merry Christmas and Happy New Year everyone...I hope the best for all of you and may you all have a happy, successful and wonderous new year. May 2011 be another awesome year for everyone. I am just very very thankful and glad everything is coming together nicely and I am slowly getting there. Back to recipes....This is so easy but looked awesome I was procrastinating if I should post it. It is Stained Glass Jello and is themed Christmas because of the colour. It is adapted from justJENN and tasted as awesome as it looks. Made these Stained Glass Jello for a Christmas Eve party. It was well received and there really isn't a story behind it. I really just love trying out new things. My heart would be easily warmed when I look at the smiley faces and joyful munch from my friends when I serve my food to them. Christmas itself to begin with is nothing big for me and my family back in Malaysia. Here, it is. For me, Christmas is all about being merry and getting together. It gives everyone a reason to be at the same spot, celebrating, reuniting and thanking each other for things, though you really do not need a reason to come for the food. My Christmas, it is the people that I celebrated it with that have made it so special for me everytime. Together, we sat down, reflecting over things that have happened through the years, reminiscing good times and accepting down times. Dissolve the box of raspberry and lime jello, separately, into 1 cup of hot water. Pour it into individual containers and chill it for a couple of hours or overnight. p/s: I'm pretty sure the direction on your jello box says to add 1 cup of hot water and dissolve everything, then add 1 cup of cold water to it. You know what, ignore it! Once solid, cut them up individually (a plastic knife, slightly wetted works best here) into small cubes. Carefully combine all the coloured cubes into a large container or like me, swap half colour into each other's container and gently mix them up a bit. Pop it back into the fridge while you make the condensed milk jello to gel everything together. Gosh....look at how gorgeous they are even before they are finished. Awesome! To make the condensed milk layer, measure out 2 tbsp of the water from the 1 cup water and place it in a shallow bowl. Sprinkle the 2.5 tsp gelatine powder over the 2 tbsp water and let it stand for 5minutes. Heat the remaining water until almost boiling and turn the heat off. Pour in the gelatine paste and whisk to dissolve completely. Pour in the 3/4 sweetened condensed milk and cool it completely. Pour the completely cooled milk mixture evenly between the two containers (or pour everything into one large container if that's what you did) and chill it until completely set. Unmoulding would be easier if you've used plastic containers rather than a solid glassware of baking tins. Slice and serve and be wow-ed! It is as much fun making them and as much fun eating them! They taste great together and not overly sweet at all. And you could easily make some with more colours or make it accordingly depending on your party's theme! Having said that, this is my entry for the Christmas Giveaway hosted by Swee San of The Sweet Spot. Swee San, if I may say, the books you are giving away is drop dead awesome, NOT pretty good. Jeez....I cannot wait to get hold of Nigella! Also would like to thank you for introducing websites such as BookXcess and BookDepository to your readers. One of my Christmas gift from Aaron comes from there. A Day at El Bulli is a pretty amazing book! Have been very very busy. Been updating the Facebook a bit but not so much of the blog, I need to get my prioritization right. Now, life is getting back on track. Perth was a lot of fun, it was all about the food and like what I have mentioned in my Facebook status: Quinn came back from Perth a much happier girl, could not wait to move to Perth end of this year, had so much good food and good company in Perth, snapped a lot of random shots, met a cute bartender, checked out awesome-looking toilet and bought a couple of things she really liked...Life is so good! The caramel sauce was to die for....seriously. It is so good on almost everything. Having said that, the next post, you will probably be seing desserts with salted butter caramel again. I still have a small jar of it sitting in the fridge. It is beautiful on anything....Use it like how you would of Dulce de Leche basically. Lusciously thick and dark, after being cooked down for a while over the stove. The saltiness comes through obviously and I like it...A LOT! Before anyone hate me, I better clarify. I did not exactly smuggle. The restaurant is owned by my boss and I am one of his staff out of the 18 restaurants he owned across Adelaide. He happily gave them to me during one of out regular staff dinner when I asked, and yes, he looked at me weirdly and it made the situation very awkward, I have no choice...I was desperate, the power of blogging and shooting photographs!